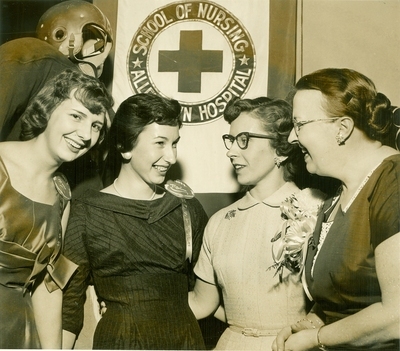 From left to right these ladies are co-chairs Marcia Thamarus and Marlene Zimmerman with their advisor Mrs. Josephine Ritz and the Director of Nurses, Mrs. Ethlyn Eichel. Do you know what year this event took place? What are they smiling about? Allentown Hospital, 17th and Chew St.